Poke cakes are one of my favorite desserts to make. This version uses one of my favorite flavor combinations! So fresh and perfect for Summer. I just love poke cakes! I only have one recipe on my site for one – it’s to DIE for – but I make different variations all the time for special occasions, birthdays and BBQ’s around here. They’re so easy and perfect to make for those kinds of things! 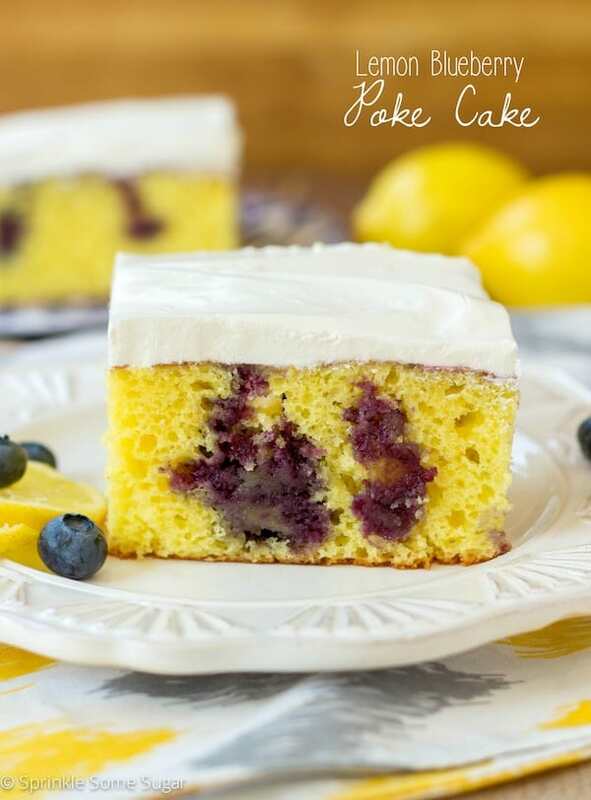 I love the combination of lemon and blueberry together so this cake is right up my alley. 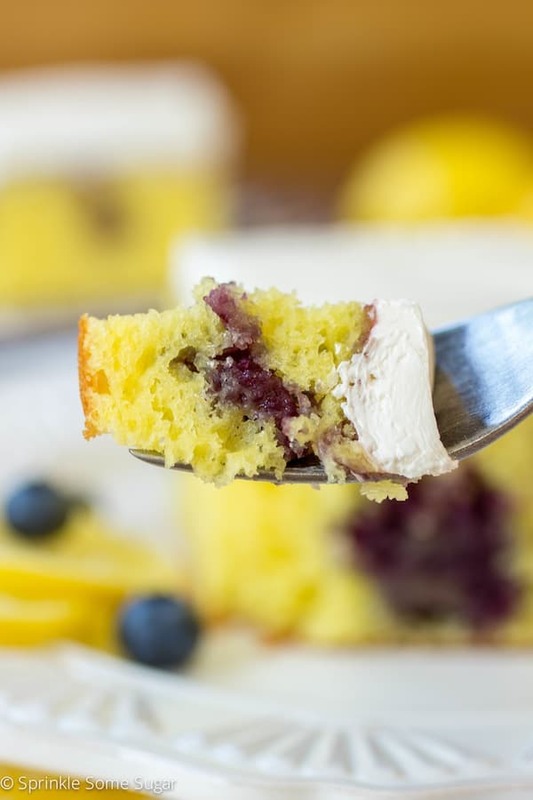 This lemon blueberry poke cake starts with a cake mix, is filled with the most delicious homemade blueberry sauce and is topped with a tangy, lemony whipped topping. So refreshing on a hot Summer’s day – especially because it is served chilled! The lemon cake is incredibly flavorful and moist. Sometimes the flavor of lemon cake mixes can taste a little artificial, so to give it more of an authentic, homemade-tasting lemon flavor, I added in some fresh lemon juice and zest. This really adds so much fresh flavor to the cake and makes it super lemon-y! The blueberry syrup is made by simmering some blueberries, sugar and a little bit of lemon juice until the juices start flowing. They get mashed up and pressed through a fine sieve and create the most delicious looking pink syrup. After it thickens for a short while, it gets poured into the holes you will create in the top of your cake after it’s baked while it’s still warm. Then it gets placed in the refrigerator until completely cooled down and chilled. The whipped topping is pretty simple. Some cool whip, powdered sugar and lemon juice is all you’ll need. If you want to add some lemon zest for even more flavor you absolutely can but I wanted mine to be perfectly smooth. You may notice they the topping is a little bit thinner and glossier than a normal frosting. It will firm up once it starts chilling in the refrigerator to the consistency you see here in the photos. Smooth and luscious! This cake is so perfect for any occasion and is sure to be a crowd pleaser with all of its sweet and tart goodness! Preheat oven to 350 degrees. Grease a 9x13 pan well, set aside. In a large bowl, whisk together cake mix and pudding mix. Add sour cream, milk, oil and eggs and beat until smooth. Pour into prepared pan and bake for 23-25 minutes or until a toothpick inserted into the center comes out clean. While cake is baking, you can prepare your blueberry syrup. In a mesium-sized saucepan, add blueberries, sugar and lemon juice. Simmer on medium-low hear for 5 minutes or until the natural juices start flowing. Mash them down a bit so more of the juice comes out. Turn stove to low heat and simmer another 5 minutes. Mash one more time then strain through a fine mesh sieve over a bowl to remove all blueberry pieces, you only want the syrup. Allow to cool a bit until the cake is done baking. Once cake is done, allow it to cool down a bit until warm then poke holes into the top of the warm cake, I would say about 25-30 holes if you need a number. Pour syrup into all of the holes making sure to fill each hole - though, it will not fill all the way to the top of each hole. Place cake in the refrigerator and chill until cold, 30 minutes - 1 hour. To make the frosting, beat whipped topping, confectioner's sugar and lemon juice until smooth. This makes a ton of frosting, so if you only want a small layer, reduce the recipe to half. If you want as much as shown in the photos, don't alter the recipe. Smooth the frosting over the cooled cake and place back in the refrigerator to firm up, as it will be quite thin after beating with a mixer. Serve chilled at least 4 hours after making it, to allow the flavors to meld together a bit. 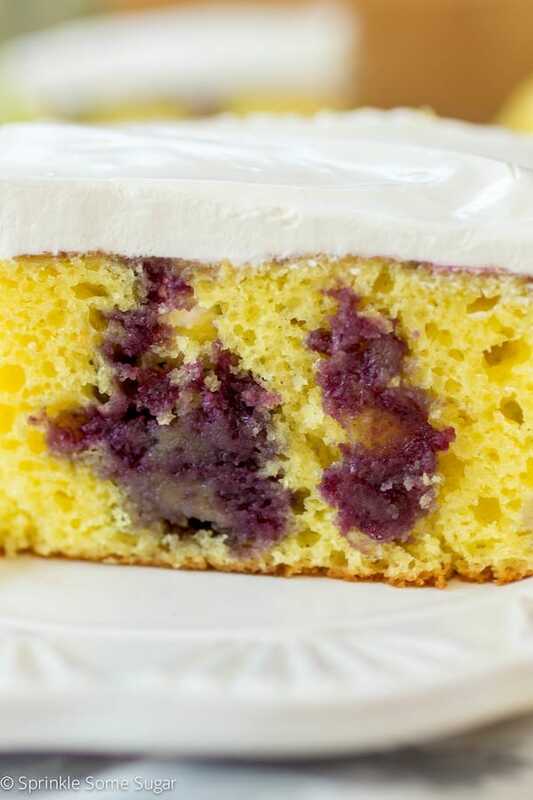 Lemon Blueberry Poke Cake will stay fresh for up to 5 days stored in an airtight container in the refrigerator. My cake fell as soon as I took it out of the oven. It took 35 minutes to bake. It was still very jiggly at 25 minutes. I hope it tastes ok. Sounds like it wasn’t baked long enough. Hope it came out ok, Mindy!